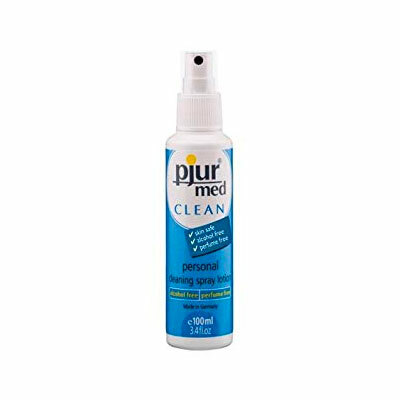 Pjur Med Clean Spray is the only alcohol-free cleaning product on the market today that provides protection against bacteria, fungus, and even lipophilic viruses. Its completely alcohol-free formulation makes it the ideal cleansing product for sensitive skin or mucous membranes. For gentle cleaning of intimate areas. The mild formula of Pjur Med Clean Spray has also proven its value when it comes to cleaning toys, particularly since they don’t have to be rinsed with water after cleaning. Alcohol-sensitive materials such as rubber, latex, or silicone are not affected.